It's AMD versus INTEL at CompAmerica these days, as their launch schedule roles out new mobile Video technology: the new nVidia 7900 GTX Video adapter, which has broken all records for Multimedia, Business Graphics and Gaming. The Dolphin 5524 is a high flying Centrino Duo Core Duo machine, the new "super" ORCA FX-260 adds Dual SATA Raid Disk Drives, Dual CD/DVD burner, and instead features AMD's FX-60 Dual Core processor. http://www.compamerica.com/mobilstar. It's become AMD versus INTEL at CompAmerica these days, as launch schedules bring the new, unbelievably fast 7900 GTX Video Processor from nVidia to life. Featuring 256MB of DDR3 Video memory, CompAmerica is progressively releasing new Laptop models that sport this amazing Video adapter product. The new, long battery life 17 inch Dolphin 5724 Laptop from CompAmerica (http://www.compamerica.com) represents the first of several significant advances. The new: "most powerful laptop on earth" 17 inch ORCA FX-260 represents higher overall performance than prior ORCAs. The new 7900 GTX available with them is said to achieve "Extreme HD": from 2x to 4x the picture clarity as High Definition 1080i/1080p Television, in multimedia applications played on CompAmerica's new Laptops, for the ultimate media experience. 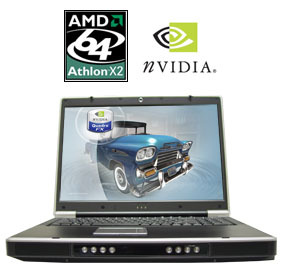 Both laptops were released over the Memorial Day Holiday with the new 7900GTX, and met rave reviews by local evaluators. One uses Intel's Centrino Duo, Core Duo design (the Dolphin). The other uses AMD's X2 and FX-60 Dual Core processors (the ORCA). a) Both laptops sport an extremely advanced 17 inch diagonal WUXGA Glass View Surfaced LCD Screen that implements ULTRA WIDE VIEWING ANGLE, a 16:10 Ultra High Definition aspect ratio, and native 1920x1200 Extreme High Definition screen resolution. b) These amazing Laptop Superscreens are coupled to the newly launched nVidia 7900GTX 256M DDR3 "Extreme" Video Adapter that achieves unheard of performance in the Extreme HD zone. c) CompAmerica's Glass View Surfacing uses a solid crystal optical matrix bonded to the surface of the Laptop's LCD. It causes a brighter, richer, clearer, optically purer image from the laptop display, and widens the sidewards angle of view to nearly 178 degrees. d) The Dolphin 5724 17 inch Centrino Duo model achieves a somewhat longer battery life than it's single core Pentium M predecessor, the 5722. This is the result of the new i945GM mobil Centrino Duo chipset from Intel. e) Both models benchmark at nearly 100% faster than single core models. The FX-260 is also available with single core AMD Athlon 64's for smaller budgets. f) The Dolphin 5724 is both light of weight and sleek of footprint. It is intended mainly for mobility even with its big 17 inch screen and full size keyboard. Both keyboards incorporate a full calculator keypad, and "stable key platform" design that makes typing a pleasant experience. g) The faster, slightly higher priced ORCA FX-260 is intended to provide extreme top of the line performance and is meant for applications requiring larger RAID disk storage and even multiple optical devices. It sports a built in Subwoofer and four channel speakers, as all ORCA models do. "We overcame an issue regarding battery life when taking on both the new 7900GTX Video Processor with our patent 17 inch Glass View Surfaced Super LCD Screen, as well as the new dual core processors from Intel and AMD. We were pleasantly surprised that Intel's new 945GM chipset and AMD's X2 Chipsets both have far better provisions to conserve power than the Press on them. That resulted not only in longer battery life than we expected, it achieves it without harming performance." said company Chairman Dr. Jack A. Shulman. 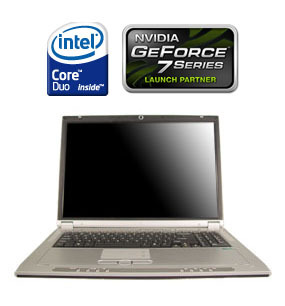 "These two Laptops are both great performers. One is for mobility, the other for pure speed. The ORCA FX-260: what can one say about the most powerful laptop on earth other than that this new edition blows the doors off the competition, like Apple's dual core laptop. Yet, it costs thousands less than machines in its league being offered by other competitors." The new ORCA FX-260, released at the same time as the DOLPHIN 5724, sports a high end AMD FX-60 dual core processor rated 5200+ MHz in equivalent performance that is at the top of the charts. The Dolphin 5724, also a very fast system, is rated at from 3300 to 4500 MHz in equivalent performance, and clearly benefits from its Dual Core INTEL design. Both machines break benchmark records over all other competitors in their league, stated a company spokesperson. "We are very much looking forward to even more upcoming multicore designs from both Intel and AMD. They are heightening current Windows XP stability and throughput and enhancing future Vista experience in 2007, by overcoming multi-tasking demand with multi-core processing. The new crop of dual core CPUs also eliminate pauses, holds and delays in operation. They make the Apple Mac and MACOS/X look dated by comparison." added Shulman. "We offer an alternative operating system to MACOS/X, called CompAmerica AX6 here. (http://www.compamerica.com/AX). We are debating releasing it for general use on all PCs. It is also based on BSD Unix and OpenVMS, like MACOS/X and Windows 2005. Yet it was really meant for business-class servers and on multi-processor, multi-core workstations like our 8-way/16-way Viper VSX workstation. We find Red Hat Linux or other Linux distributions to be well suited to entry and SMB PC applications, moreso than the full BSD Unix. AX6, however, is an extraordinary Enterprise league OS for the utmost in computational technology in any application. Yet it may not be meant for those who do not know how to use all of its amazing features." "We welcome them joining the race. I can remember meeting Steve Jobs and his partner when I was at Citicorp in the mid 70's back just around the time Apple started making Home PCs like the I and II/e. I seem to recall 'the Steves' wanted business with Citiswitch, a project I was working at that bank. They were once very good at Home PCs so I instead cooked up some financial backing and marketing assistance for their ideas. It's actually a shame they seem to have left what they were best at behind, servicing the consumer home marketplace." Adding: "Oh, yes, they do have the iPod: It seems to have made its mark on home users and may have already seen its day. Yet the iPod seems to largely isolate its most devout users from the rest of the world, a sort of 'jack-in, drop out, go nowhere" addiction. We call the iPod community, here: Generation Nowhere. Talk to them and you often get waived off or it takes a while for them to readapt and communicate with you. As a parent, it makes me worry when a youngster believes their iPod is more important than their circumstances, so I temper its use a bit with the kids." CompAmerica is an industry leader in mobil technology and personal computing headquartered in Central New Jersey. CompAmerica offers onsite services to customers throughout the world on its PCs, Industrial Computers and Business Servers. The company can be reached by web at: http://www.compamerica.com and by phone at: 888-275-2771. Dolphin 5724 Core Duo LaptopAn amazing combination of advanced video and powerful dual core processing. ORCA FX-260The world's most powerful laptop computer!